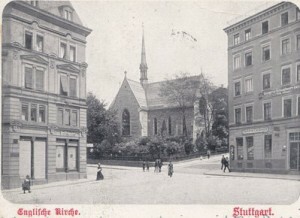 There have been Anglican services in Stuttgart since the early 19th century. Our present church, St. Catherine’s, was built in the 1860s with money from a bequest by Catherine Masson who died in Stuttgart in 1860. She requested that a church bearing her name be built for the Anglican inhabitants of Stuttgart. 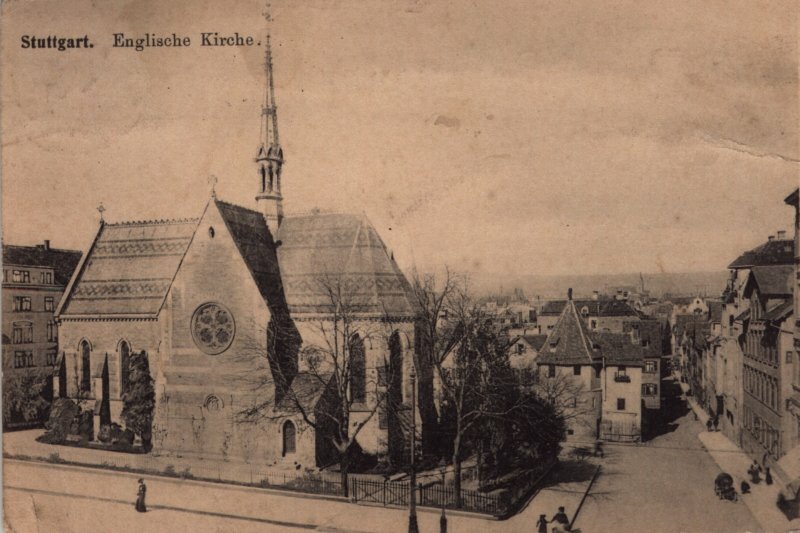 The church was built between 1864-65 to plans by Prof. Heinrich Wagner of the Technische Hochschule in Stuttgart. It was consecrated by the Bishop of Honolulu on behalf of the bishop of London in 1868. The original building was destroyed during WW II and was rebuilt by the Old Catholic Congregation. Today the building belongs to the Old Catholic Church and the Anglicans use the premises as guests. In 1797 the future King of Württemberg, Frederick I, married the daughter of King George III of England, Princess Charlotte Augusta Matilda. The marriage contract stipulated that Anglican sacraments should be provided for her in Stuttgart. These services were conducted in private by a court chaplain but are assumed to be the first Anglican services held here. The first mention of public Anglican worship comes in the early 1840s. 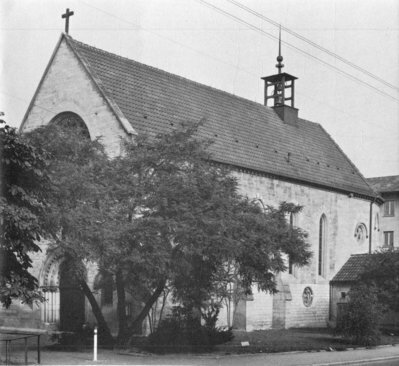 The number of English visitors to the Stuttgart area, through the close ties between the courts and the health benefits of the springs at Bad Cannstatt, led to the establishment of Anglican services in the prayer room of the Reformed Church situated in Langestr. The Chaplain, Revd. Herbert Beaver was licensed on 23rd July 1841. From 1846 a prayer-room in the Orphanage in Charlottenplatz (now the Amadeus bar) was paced at the disposal of the Anglican community for their services. In 1852 a “Chapel-building Association” was founded and in 1953 it handed over the sum of 1150 Gulden, 32 Kreuzer to the Town Council as a start towards building a chapel. Plans for a chapel were drawn up but the funds were inadequate. Difficulties with the orphanage meant that locating a venue for worship was a priority for the community, which at that time consisted of around 150 persons. In 1860 their prayers were answered. Mrs Dunbar Masson, a rich shipowners widow, from Liverpool, was staying at the Hotel Marquardt with her third daughter Catherine. Catherine was seriously ill and had come to Stuttgart for treatment or a “kur” at the Bad Cannstatt spas. Sadly, on the 20th October 1860 Catherine died. On her deathbed she asked her mother to use her dowry to build a church, in Stuttgart, in her memory. The King of Württemberg, Karl Friedrich Alexander, granted the right to build a church on ground owned by the town of Stuttgart. Mrs Dunbar Mason donated £6000 for the building of the church and a further £3000 for the installation of stained glass windows. In addition she established a legacy to provide the Chaplain’s salary of £60 per annum. The fund was administered by the Society for the Propagation of the Gospel (SPG) who also possessed the patronage of the chaplaincy. 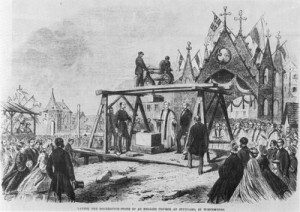 Laying the foundation stone in 1864. The foundation stone was laid on 26th May 1864 by the English Minister, Mr Gordon and the Revd. W. G. Parminter, who was chaplain at the time. In attendance were eight other Anglican priests, representatives of the Catholic and Evangelical churches of Stuttgart and Stadtschultheiß Sick, representing the Stuttgart Town Council. The first service was held in the new building on Sunday 3rd December 1865. The first baptism took place a few weeks later on 21st January 1866. On 15th August 1868, the Bishop of Honolulu, acting as the representative of the Bishop of London who at the time was responsible for chaplaincies in Europe, consecrated the church. The first marriage in the building took place on 5th August 1868 and the first funeral on the 26th August 1869. During the following years a pattern of ordered worship was established. 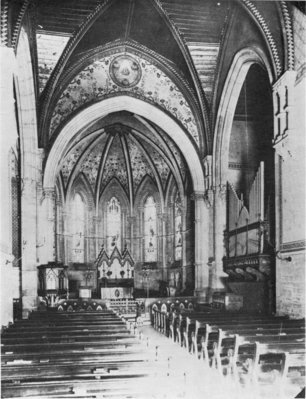 St. Catherine’s became an established part of the English community in Stuttgart and visitors to services included The King of Württemberg and the then Prince of Wales, the future Duke of Windsor. In 1909 the Old Catholic congregation in Stuttgart received permission to use St. Catherine’s Church on Easter Monday, Whit Monday and St. Stephen’s day. 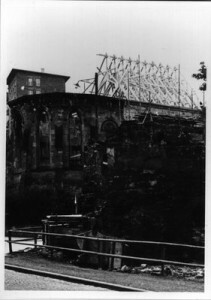 It is unlikely that those who made this offer were aware of the significance it would have in the future, but in a small way it was the first step in securing the future of St. Catherine’s through the turbulence of the first half of the twentieth century. The outbreak of World War I, in 1914, saw the first change in fortunes for the English community in Stuttgart. on 7th August 1914 they were given 24 hours notice to leave the country. The Chaplain, Revd. Weston, obtained special permission to remain and continued to conduct services whilst his wife worked for the German Red Cross. However, on 30th October Revd. Weston received a letter from the Stadtdirektion forbidding him to hold services in the church. After a period of uncertainty, German friends secured the safe passage of the Westons to Switzerland. They left on 13th November 1914 and St. Catherine’s doors closed. In the Autumn of 1944, Stuttgart was heavily bombed by the Royal Air Force. 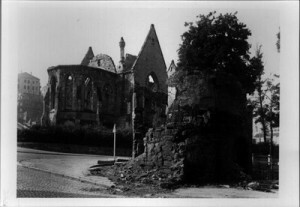 They were aiming to destroy the factories around Stuttgart, but some wayward bomb landed on the church. Some of the original walls remained standing, but so much was ruined that after the war, the city government of Stuttgart was preparing to scrape the rubble away… unless it could be rebuilt. It looked bleak for the little broken church, the Church of England had enough bombed churches in England in need of rebuilding. But thanks be to God, the Old Catholics stepped in and purchased the rubble from the C of E, rebuilding it almost stone by stone, so that it could continue life in Stuttgart. By 1957 the church was back in business, but with new owners. Even though it is sometimes called “The English Church” it is now really “The Old Catholic Church”.